Heat oven to 350°F. In ungreased 13x9-inch (3-quart) baking dish, spread about one-third of the pasta sauce. Mix spinach, cottage cheese, Parmesan cheese, oregano and pepper. 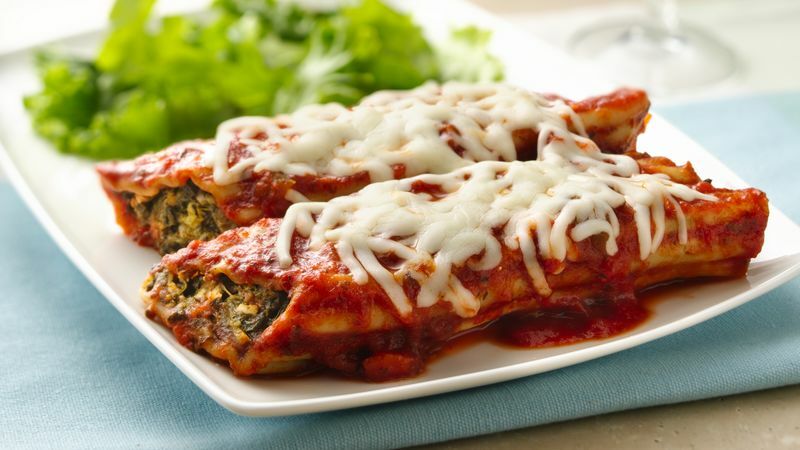 Fill uncooked manicotti shells with spinach mixture; place on sauce in baking dish. In medium bowl, mix remaining pasta sauce and water. Pour sauce mixture evenly over shells, covering completely. Cover; bake 1 hour. Sprinkle with mozzarella cheese. Cover; bake 15 to 20 minutes longer or until shells are tender. Before baking, cover and refrigerate manicotti up to 24 hours; bake as directed in recipe. Or cover tightly, label and freeze up to 1 month; bake about 2 hours. Try using a baby spoon to fill the manicotti shells--it works great!